A well-equipped ring fenced stock farm with an attractive farmhouse comes to the Dumfriesshire market. Auchentaggart Farm is a peacefully located unit located near Mennock, approximately three miles south of the Royal Burgh of Sanquhar. The sale comprises a traditional farmhouse currently separated into two large self-contained dwellings, a range of traditional steading buildings as well as a number of modern farm buildings and stores. 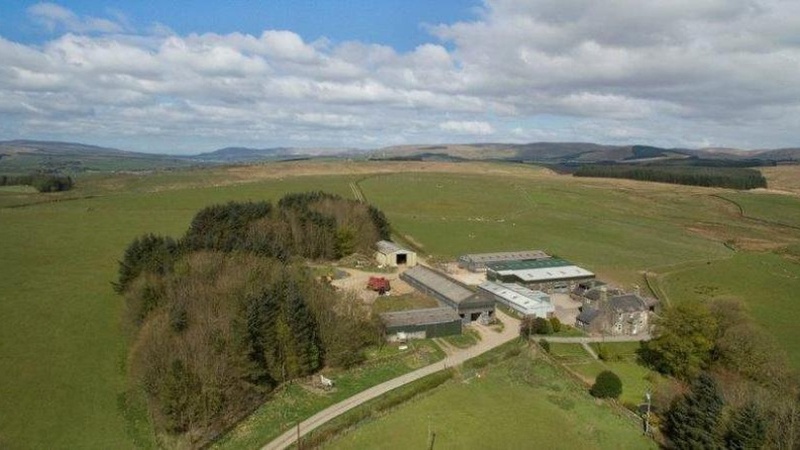 The land at Auchentaggart Farm extends to approximately 307.79 Ha (760.55 Acres) and is currently centred on a herd of pedigree Luing Suckler cows and around 350 ewes, although there is the capacity for double that number. The land sits between 150ft and 860ft above sea level and is generally sloping with south easterly aspect. The land all lies within a ring fence and the mix of in bye pasture and productive hill grazing is ideal for summer grazing of livestock and sheep. There is an excellent range of modern and traditional buildings which are situated in a group to the north of the farmhouse, these include: a stable block, boiler house, barn, stored shed, cattle shed and court, a large feed store and a silage pit. Auchentaggart provides a unique opportunity to buy a substantial and well-known stock farm with an attractive farmhouse and good range of farm buildings. In addition to this, the topography of the land and the various areas of woodland allow for the potential to expand the existing sporting dimension on the farm and create a really exciting small farm shoot. Sanquhar is centrally located within the south west of Scotland, approximately 30 miles from the regional towns of Dumfries and Ayr. Sanquhar benefits from a wide range of amenities, well-regarded schools and a main line rail station for the Glasgow and Carlisle route. Auchentaggart Farm is for sale with CKD Galbraith at offer over 1,700,000.